New day, new game. I have had a few good games with Rahn the last few days. And shooting for a new win today with Rahn. I found myself on the otherside of the table to Legion. I have played against today's opponent earlier. I know his list, and know what it's capable of. I personally believe this to be the strongest list i have faced off against Legion. We were playing the scenario, Outlast. Rahn won the dice roll, and opted to go first. 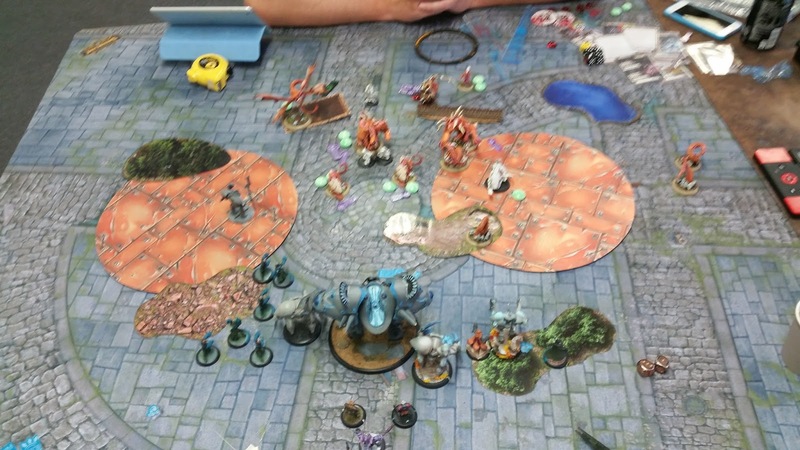 Thagrosh carefully picked the side that gives Rahn the least amount of terrain to hide behind. I had a few ideas I wanted to test out during this game, first and foremost, I want to see how much of threat Rahn can push out first turn. Secondly I would like to see how this list works against a high damage output list. Especially against high defence models. 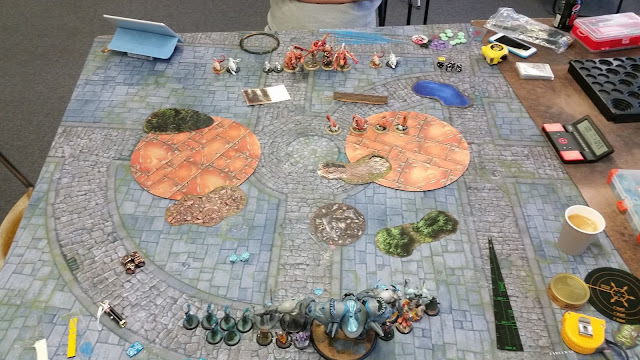 The game plan is to pressure Tagrosh for scenario, the pressure should be dealt in assassination threat.Keeping my Chrimeras in position to walk or run in, to telekenisis and slam him, for the drag to win, like Rahn always does. I run up, positioning ,models close to what it looked like in deployment. Except I, like the previous game, place my mages behind Helios. It feels like they threat more, while in the middel. I make sure my models are positioned out of spray ranges, so that I can get another turn of positioning before I have to commit to melee. As expected before game start, Raeks would be a menace this game. Legion runs up and places one Raek in the left zone, two in the middel, and the last one in the right zone. The H is placed in the right zone, and runs up in position to jam my army with the tentacles. Carnivien and Typhon run up, in position to bouth contest, and spray my back line. 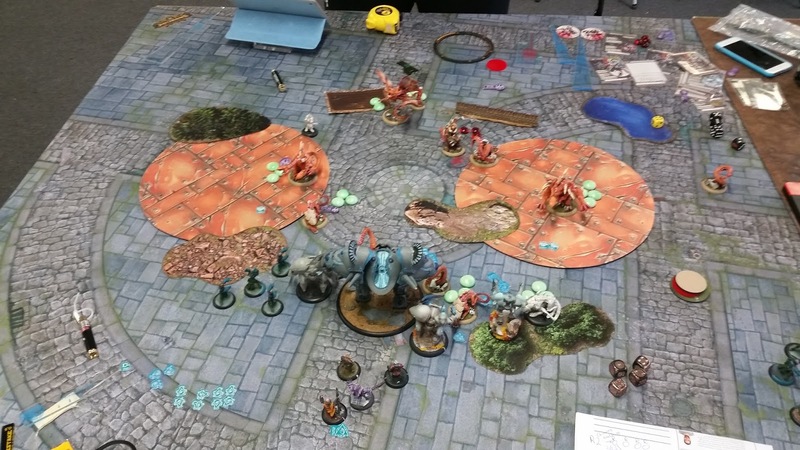 Thagrosh moves up, feeling safe, Casting Fog of War, camping 3 fury. 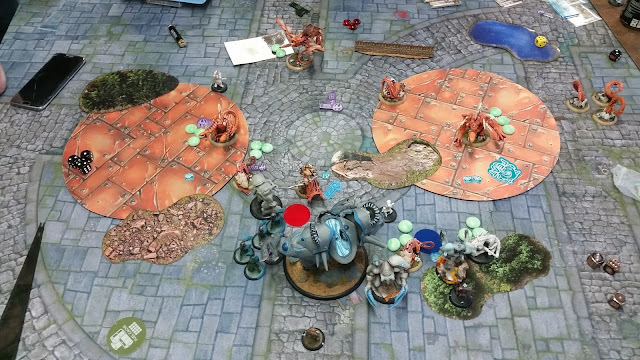 We stop the timer her, Thagrosh is in very easy assassination range as he is standing. So we agree that Legion moves Thagrosh behind the wall. Most players cannot comprehend the insane assasionation threat Rahn has. I really don't want to handle four Raeks jumping into my ranks. I opt to move one of my Chimeras into telekinesis range of the furthermost to the left Raek. The plan is to telekinesis him in place right in front of the second Raek. Then slam the first one onto the second Raek. Knocking them bouth down. So that Helois can take care of them. And giving me the left side on the table. Four dice to roll seven should be without doubt possible, even a given event. After missing the third time, Rahn had done exactly nothing. 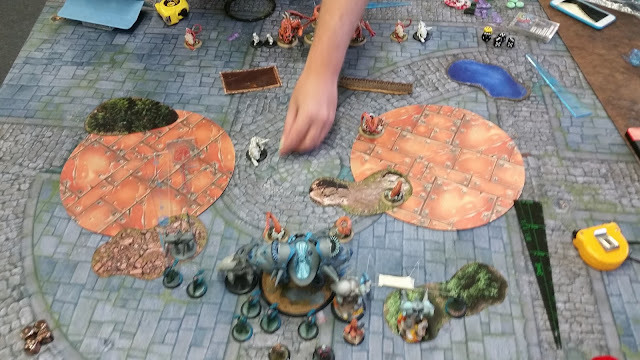 Lanyssa with her vendetta, managed to miss on a Tentacle. This is normally where i begin to lose it. Insted i counted to ten. And used my Chimera to headbut his Raek, using the mages to kill it. 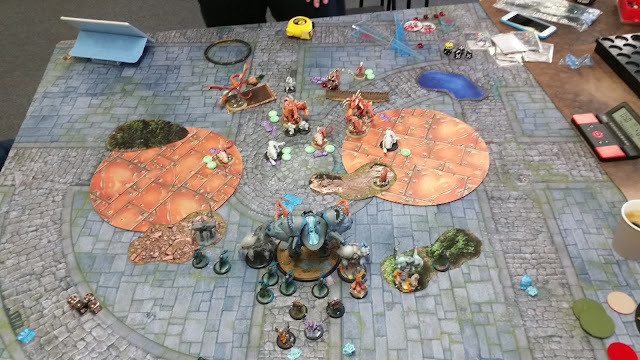 I killed a few tentacles, and shuffled abit around. Feeling a loss was about to unfold in my hands. The Legion player made a huge mistake this turn, it cost him the game. Reeks were moved up to jam. Tentacles ran up to jam. Typhon charged in and killed the Chimera in the left zone. Thagrosh sees the opportunity to score three control points here, in all his excitement he forgot to feat back the one killed Raek. I believe that, if he had feated it back. I would have been jammed so hard down that I would not find and opening. Lanyssa was killed, so was the Magister. A few points og damage was dealt out, nothing important. Legion scores three control points. Thagrosh is standing on the base toeing the zone. I'm too far behind, I can't get back on control points. And the one beast I have killed will be feated back next turn. Cant play the attrition game anymore, nor is scenario on the table. The Airwolf theme song keep running in re-run in my head. It's assassination time. My first plan is to clear around my last Chimera. But after failing to kill a Raek with my right Sphinx. I gave up that plan. The second Sphinx clears around Helios on the left side. Clearing a pathway for the man himself. Rahn walks up and telekinesis Thagrosh, and placed him in front of the Hellmaw. Then slams him into the Hellmaw! I cannot but feel the irony here, The overpowered unit, Hellmouth giveth, Hellmouth taketh! Thagrosh is dragged all the way down to Helios, and is killed! This game was hard, it doesn't give me many options in attrition. I need targets that I can pull in and kill before we engage in the middle. With four stealth models in front, I'm trading for a loss. 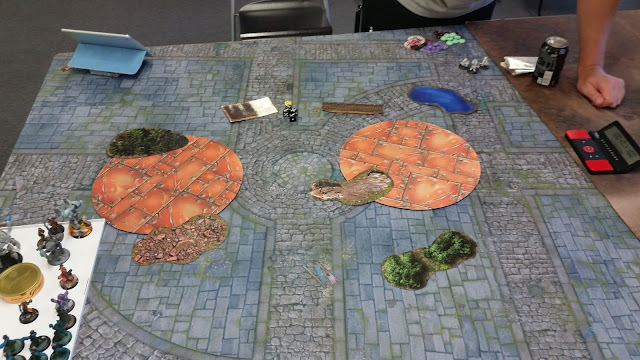 I guess I could have played my round two better, and given my opponent less options. Therefore I'm still not sure if Rahn is on the down side or not. Also Rahn has a safety, I WIN, button with his feat. Need more practice against Legion, and stealth in particular.